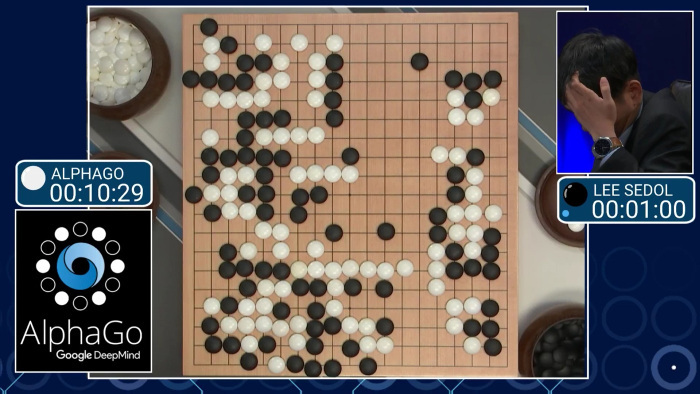 Description (from AlphaGo): With more board configurations than there are atoms in the observable universe, the ancient Chinese game of 'Go' has long been considered a grand challenge for artificial intelligence. On March 9, 2016, the worlds of Go and artificial intelligence collided in South Korea for an extraordinary best-of-five-game competition, coined the Google DeepMind Challenge Match. Hundreds of millions of people around the world watched as a legendary Go master took on an unproven AI challenger for the first time in history. Directed by Greg Kohs with an original score by Academy Award nominee, Hauschka, AlphaGo chronicles a journey from the halls of Cambridge, through the backstreets of Bordeaux, past the coding terminals of DeepMind in London, and, ultimately, to the seven-day tournament in Seoul. As the drama unfolds, more questions emerge: What can artificial intelligence reveal about a 3000-year-old game? What can it teach us about humanity?